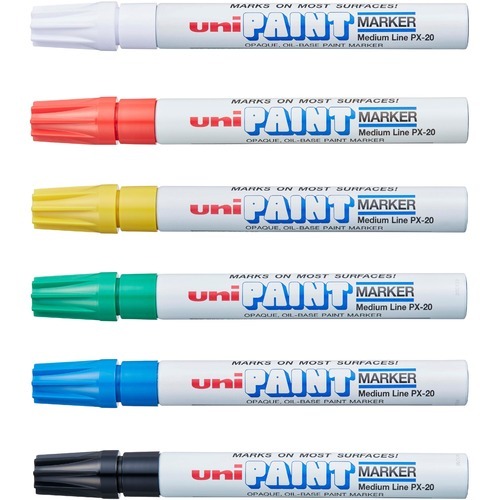 Sanford Acid-Free Oil Base Markers - White Ink, Blue Ink, Red Ink, Green Ink, Yellow Ink, Black Ink - White Barrel - 6 / Set - Welcome to TABS! Opaque oil-based paint markers are perfect for arts and crafts. Dries opaquely on practically any surface. Six-color set includes: black, red, blue, green, yellow and white. 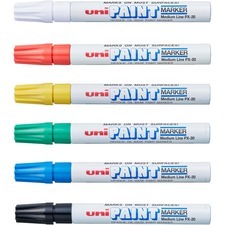 Opaque oil-based paint markers are perfect for arts and crafts. Dries opaquely on practically any surface. Weatherproof and fade-proof. Acid-free. Six-color set includes: black, red, blue, green, yellow and white.